For the month of February (which is also the two-year anniversary of the atlas), I am presenting the dungeon challenge. 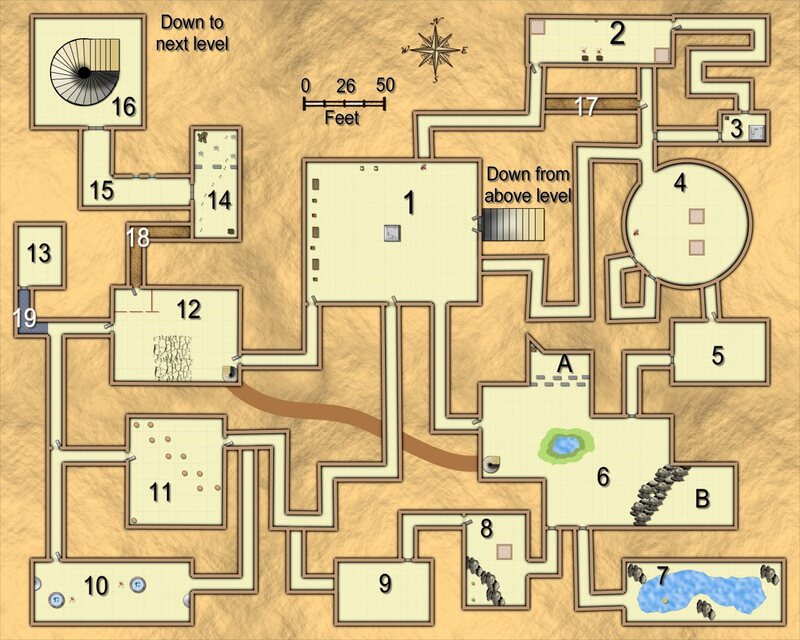 Challenge is simple enough; map one of the dungeon levels for the mega-dungeon. One entrance from above, one going down to the level below. As before, even if the challenge is related to the atlas, you can participate in the challenge without handing in the map for the atlas, although I do hope most people will allow their map to be used in the atlas. This is also a very good starting point for new contributors to the atlas. But if you just want to participate in the challenge and not contribute to the atlas, that is also completely fine. The goal here is participation, with atlas maps as a secondary bonus. The fun part about this challenge is that each person participating will map a dungeon level, and together, they will form a mega-dungeon. 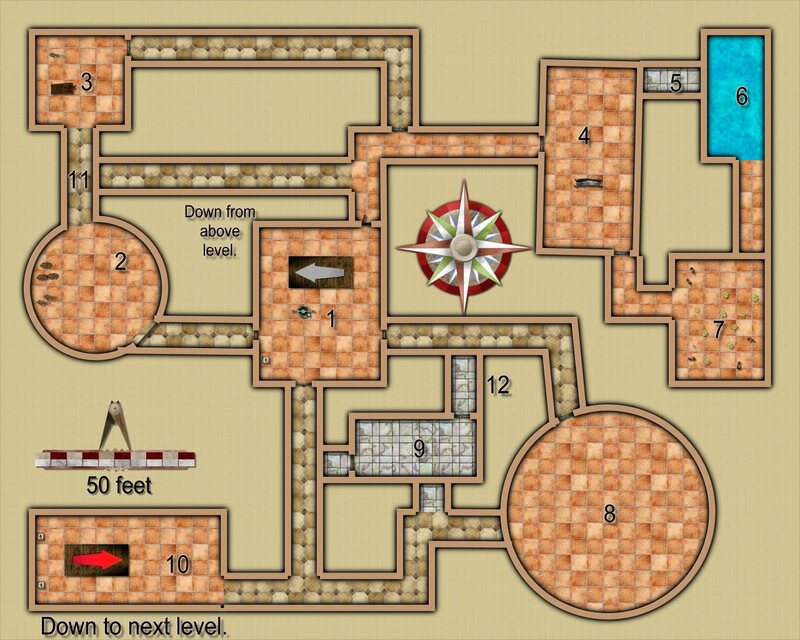 So, to make this wok, there is one requirement for the dungeon level, it must have one entrance from above, and one exit going down. Since nobody knows what map will be above or below theirs, don't add any other kinds of exits/shortcuts (like pits opening up to the level below, bottomless chasms and such) that would lead off your level, stick with the single entrance and exit. As usual, if you intend your final map to be allowed in the atlas, you must adhere to the atlas guidelines. When participating, please make a topic of your own and show the progress as you create the map. It is so much more fun seeing the map being developed than just get a completed map in my hands. I hope to see many people participating, and feel free to spread the word. And please don't hesitate to ask if you have any questions. The Temple of the Unholy has a rich, terrible and varied history. Located east of The Scar on Alarius, it has seen centuries of use. The first part of the structure were built by elves more than a millennium ago, but since then it has changed hands many times, due to war, diplomacy, treachery, deception and murder. The temple as it stands today contains architectural elements from dozens of different races and time periods. But perhaps the most fascinating thing about the temple is not what lies on top, but what can be found below. What started with simple basements quickly turned into a dark sprawling dungeon. Each inhabitant of the temple up through the millennium have both changed the existing dungeon, as well as adding on, making it larger and better fit his needs. That need being prison cells, secret escape routes, traps for the enemies, hiding places for the faithful and so on. Some places which now are part of the dungeon even used to belong to underground races, some of which even extended the dungeon upwards to assault the temple from below. This has all resulted in the temple sitting on top of an uncounted number of dungeon levels, designed by different races for different purposes. No expedition have yet reached the bottom, and returned to the surface to talk about it. Mind you, it is certainly possible that one of the lost expeditions did reach the bottom, for lost expeditions severely outnumber the successful ones. Who knows, perhaps some of the people from the lost expeditions still walk the corridors of the dungeons below The Temple of the Unholy? So, is a small stream out ? I would like to add one to my map. Nah, a stream would be fine. Underground rivers do exist at various depths below the earth. I made it illusional... about to post my room descriptions and map so far in the other thread. The one staircase rule is simply so that people can submit new maps without being locked by the layout of the above map. This allows the map to appear in any order, and it allows two people to map their floors simultaneously without having to coordinate their efforts. It is admittedly more a convenience measure than a logical one, but it really makes things easier because nothing need to line up. For one staircase, the floor below can be any size, offset, and rotated at any angle compared to the room above, once you introduce multiple entrances you start enforcing all kinds of things on the level below, such as size. Thus, knowing there is only one staircase coming down from above gives the next mapper a much easier time. I'll happily relax the rule for anyone wanting to map two (or more) levels in one go though, as well as if two people want to cooperate on their levels (assuming they are handed in at the same time). Also, I don't mind people adding stairs up and down from sublevels and such. 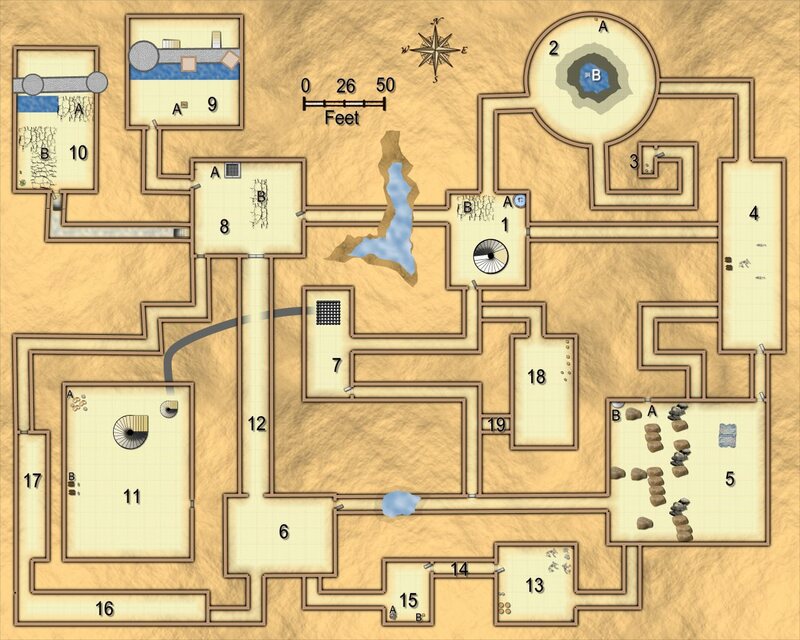 Even if the levels as presented in the atlas can of course get a little linear, I am thinking that anyone using this dungeon can also reorganize things as they please. Should be easy enough to add a few extra exits, and just set things up differently if desired. I have thought of a bit here and there for a sub level. This sounds like great fun. Wish I could participate but I'm going to have to miss this one as I have been hired to write the manuscript for a 300-page D&D5e campaign as well as re-write a classic Call of Cthulhu campaign. So I'm already burning both ends of the candle... I miss my mapping, though, so I hope to get back to it (and be more active here again) as soon as I have these jobs done. We are all stuck at home today due to a massive snow alert, its not snowing, so I have time to map. I'll work on more than one level. What about a few small 'connector' generic levels ? Say 250' x 200' ? Or would it be preferable to make mine all the same size ? I did think about, after seeing the circle level, to do an L-shaped level. Or a large square level, with a pit in the middle that appears to go somewhere, but doesn't. Ha, me too, however, I work from home half the week, so not too much mapping for me. Posted By: JimP What about a few small 'connector' generic levels ? Say 250' x 200' ? Or would it be preferable to make mine all the same size ? Sure thing. Same size is not required at all. Okay. I'll work on some. And the L-Shape as well. Oh, just thought of this. How are we going to label these maps ? My suggestion would be megadungeon_mapperinitials01, megadungeon_mapperinitias02, etc. for our submissions. Would that work ? 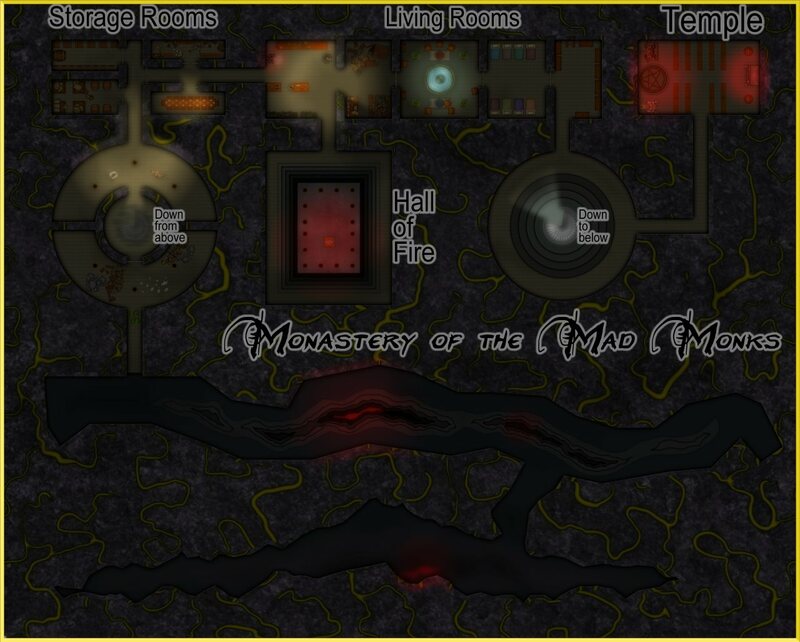 The final map names for the maps (in the atlas) will all be "Temple of the Unholy Dungeon" with a subtitle of whatever the mapper wants to name that particular level. (With the numbers incrementing obviously, and using a letter suffix for sublevels). I'll need to handle the numbering after receiving them obviously, so you can just use your own incremental numbering from 1 if you submit more than one map. I don't really need the initials. I figured you had a system. I was just trying to sort it out n my brain. I'll be submitting at least two maps. So, been giving this some thought and think I have a few ideas, which raised a question. Is there are limit to the height the map is? For instance, let's say I have a cavern, the height of the cavern is 30' there are passages within the walls of the cavern that lead to some caves with ladders, natural steps, some sloping passages, etc... that link it all together. 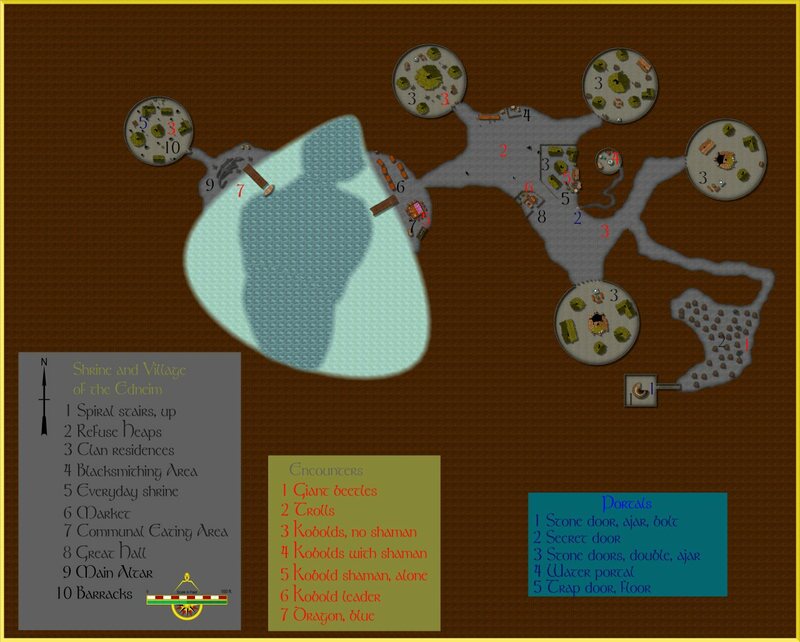 The whole cavern would be mapped on one map (like the Caves of Chaos from B2). Keeping things to my time zone as usual, it is now officially February and the challenge is underway. I know several of you have already started the work, but I hope to see many more join in. And remember, these challenges are just as much about challenging yourself as trying to "win" this. Please participate no matter your skill level. This is just a fun way of trying out various mapping techniques and get some mapping training, not an art contest. And remember, even if you don't want your map to end up in the atlas, you can still participate here. While I love getting more maps for the atlas, and I use the atlas as the "setting" for these challenges, participating in the atlas is not a requirement for participating in the challenges. On the contrary, I want as many people to join in on this as possible, so I won't require anything that people might feel is a barrier to entry. Here are my submissions. Hopefully I'm not too tired to do this correctly. Thanks Jim. Our mega-dungeon is now 4 floors deep. And, before your submission, the atlas had 296 maps, so you just submitted map number 300. Congratulations, and thank you. Hoping for people to submit lots of more floors. February is still young, so you have plenty of time. Yippee ! Posted info on Dragonsfoot.org. forums that we now have 300 maps in the Atlas. edit: corrected a misspelling. Here is my entry to the Challenge, I hope more people join in, it was a blast! Great. Means we are up to 6 floors now. Hope many more will participate, we need floors. And remember, the more people that participate in a challenge, the better it becomes. These challenges are also the perfect way of challenging yourself too, perhaps an opportunity to try something new just for the fun of it. Haven't mapped a dungeon at all before? Well, now is a good time to start. 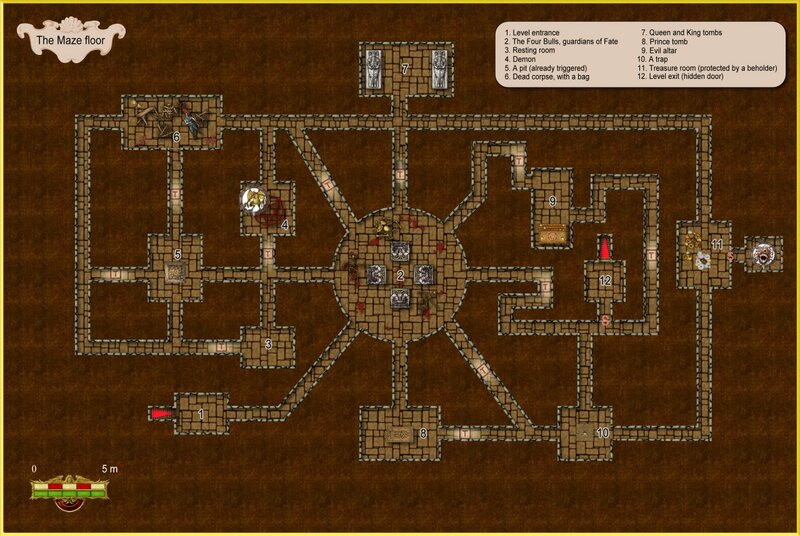 We are now halfway in February, which mean there is still plenty of time to make a dungeon floor for this challenge. Already got a handful of submissions, but I hope to see many more. Remember, your floor doesn't have to be huge, nor do you have to spend a huge amount of time on it. As always, this is as much about participation as making the perfect dungeon floor. And if dungeons aren't your usual thing, well, this is the perfect opportunity to challenge yourself a little bit. And how does it work to send you the .fcw file ? Posted By: basilgass And how does it work to send you the .fcw file ? Either attach it here (as a whisper if you prefer), or just send it via email (address in my profile). Posted By: basilgass email sent! Nothing have turned up in my inbox yet (or any other folder, including spam). Can you check that it really was sent, and to the correct address. And that isn't all, because some bits hide others! So, I've set up a separate Forum topic to show all the available options, with some more description of what's going on - though there will be a 26-page PDF (available as a text file too) to accompany the map in the Atlas version. Here is my entry - I hope i am not too late. I have been in hospital for the last 3 days, and won't be going home till tomorrow. The only internet I can get is a slow server at the library. Anyway, here goes. FCW and notes will be forwarded to Monsen once I get home - tonight, I hope. Here is my submission. I believe I am just in time. Just checked… and it was still in my send box... Should be ok now ! Well, contest is over and in total,11 maps participated. So, I just wanted to say great work everyone, I loved seeing all these new maps. I am also particularly happy that we got four new submitter to the atlas during this challenge; Linda Böckstiegel, Relyt, Autumn Getty, and Basil Gass. Thanks for taking part in the challenge, thanks for contributing to the atlas, and I hope to see all of you contribute more maps in the future. I also know that a few people started on maps that didn't make it in the time for this challenge, but I do hope you plan on finishing them for the atlas. The mega dungeon will stay open for mapping and will always welcome new maps whenever anyone feels like making a small (or large) dungeon level that can be added to it. The atlas now contains 318 maps. Map 300 was one of JimP's dungeon floors for this challenge. Thanks for participating everyone. Hope to see you all (and everyone else) participate in the next challenge too. Now, as usual, let us hold our informal "Best Map" vote. This is just for good fun, and even if your map isn't picked here, all the entries where good maps, so you can safely feel good about yourselves. So, here are the contestants. Please have a good look at them before voting. I'll leave the poll up for a week. This is going to be pretty difficult! Yeah, voting for just one map from this selection is pretty much an impossible task, but it seems to happen every time that EVERYONE contributing should really be classed as winning when we come down to this point. Very well done to all, I think. There's just so much inventiveness on show all-round both from the mapping angle, and what's been placed in the maps. 7 people have voted. Please vote ! Is there a direct link to the Atlas page for the Unholy Dungeon ? Or a search instead ? I want to post to another forum on how to get to the dungeon. Thanks. I've posted this thread to the CC3 Facebook Group. I think some of the votes have already come from there. I posted this thread link to Dragons foot's 'Maps and Plans' forum. I just got a 'Wow !' response from one poster on Dragonsfoot about these maps. 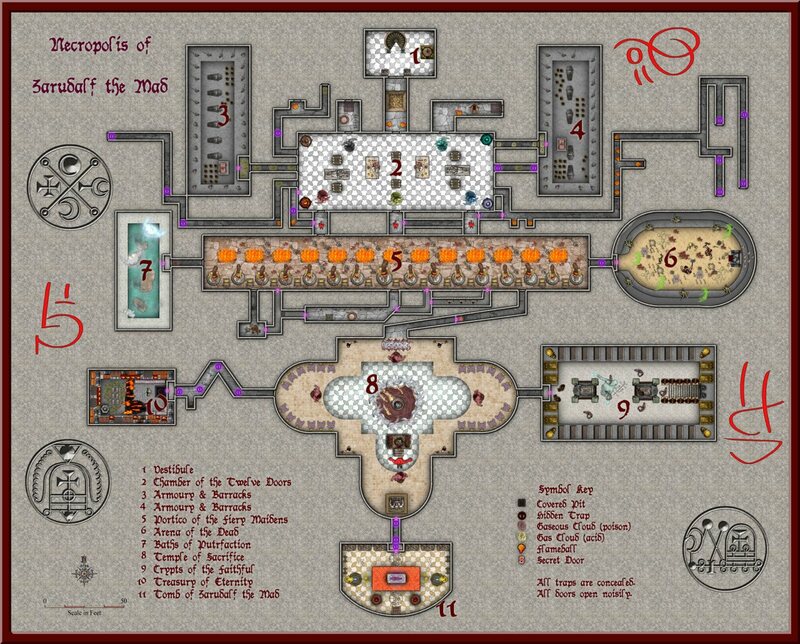 Posted By: JimP Is there a direct link to the Atlas page for the Unholy Dungeon ? This is the link for the first level. You can also just search for unholy, that will list the maps. One day I might update the search so you can get a direct link to a search result, but that isn't possible at the moment. I also notice I need to update the search page layout, those long names break the formatting a bit. Thanks. I've posted it over there. [OT] Free interactive atlas made by Campaign Cartographer 3+ in the Maps and Floorplans forum. Well, it's been 7 days so I am closing the poll. I can only conclude that people hate voting on stuff, since we just got a few more votes than maps. Oh well, even governments complain about low voting attendance. 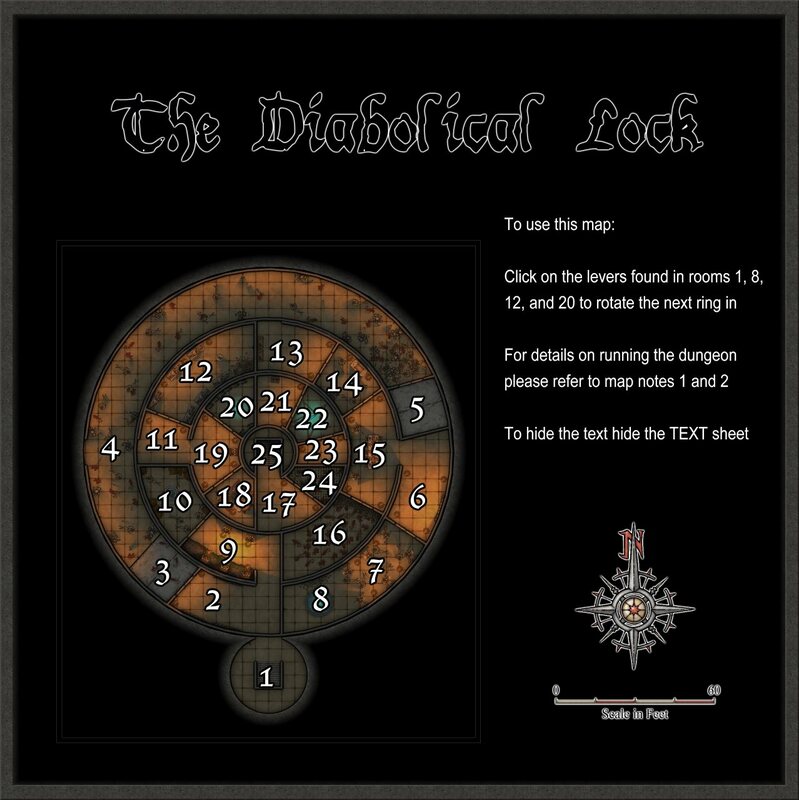 In any case Temple Of The Unholy Dungeon Level 03 - The Diabolical Lock by Relyt won best map for our little informal challenge with 4 of the 13 votes. The complete list of participants is available at the Contests & Challenges page. Thanks to everyone who participated in this. We received a nice list of great maps, and the participation is much more important than getting "Best Map" which is just a bit of extra fun with no real importance. Hope to see you all for the next challenge, you and hopefully many more. I was especially pleased this time as several new faces participated, and I am very thankful that all of you decided to allow the maps to be used in the atlas as well. It was a really tough decision. Maybe that was why the vote was so low? Well done, Relyt, and very well deserved. And well done to all of us as well. Thanks guys, Monsen definitely helped me with the finishing touches. It was a toss up for me between mine and Wyvern's. Wyvern just came out of nowhere at the end, I loved their design and theme. I thought Quenten might of had it at first though because his looks the best in thumbnail form. It was a lot of fun, I loved seeing everyone's dungeon. 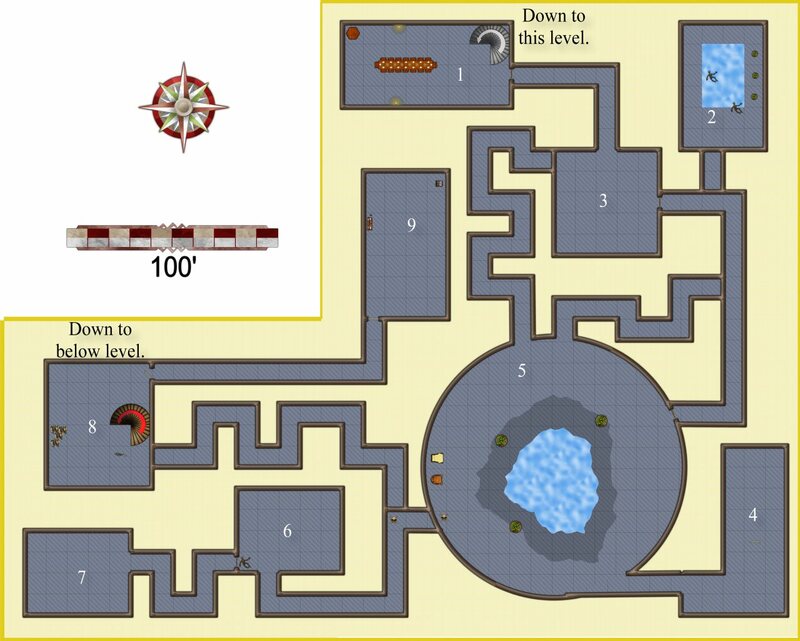 Dungeons/battlemaps are my specialty so we will see how I do on future challenges.